Entertaining someone who has a dairy allergy this holiday season? Fear not. I have the perfect dairy-free sweet potato casserole recipe that even your dairy loving guest will enjoy. I love sweet potato casserole. I feel like their are two crowds; the lovers and the haters. Pretty much everyone in my family and my husbands side are haters. But not me. For some strange reason, I love it. 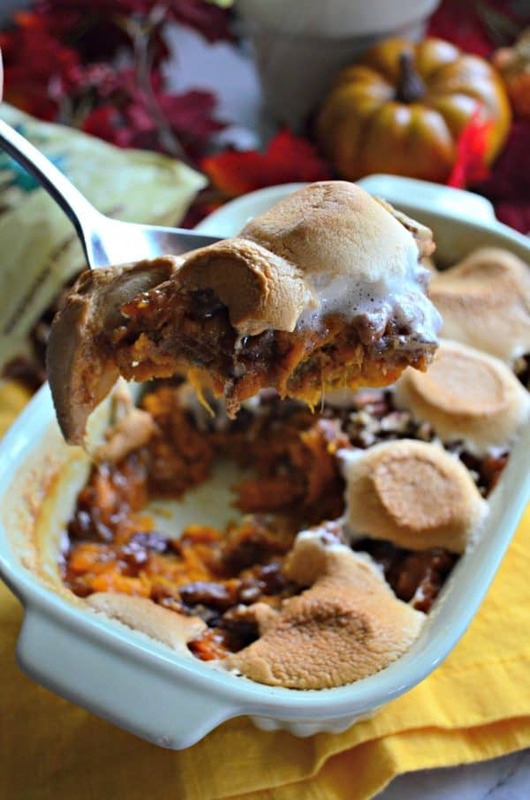 I almost always make a sweet potato casserole that pretty much me, myself, and I eat. I’ve gotten good at making a small casserole so I’m not wasting that delicious casserole. I’ve been dairy free for seven months now. Not by my choice, but my baby has a dairy allergy, and since I’m breastfeeding I can’t consume dairy. I use to think breastfeeding was the hardest thing I’ve ever endured, but pretty sure giving up dairy now tops the list. It has been an eye-opening experiencing that I don’t wish on anyone. But of course–a mother’s love, I’ll give up whatever I need to make my baby okay. After a few months it dawned on me that my holiday dinner menu was going to be much different. As in–I’ll be making pretty much an entire dinner for me (and everyone), but my mom and aunts will help make their own dairy sides. So that’s when I got in the kitchen to start developing some of my favorite holiday dishes and turning them into a dairy free version. Both my husband and I couldn’t tell the difference with my Dairy-Free Sweet Potato Casserole recipe. Best of all I can still enjoy the delicious marshmallows on top and it’s a tad bit healthier too. No canned sweet potatoes or yams here. You can either roast the sweet potatoes or microwave them–totally up to you. I like to cook them in the microwave so that way it’s done quicker. 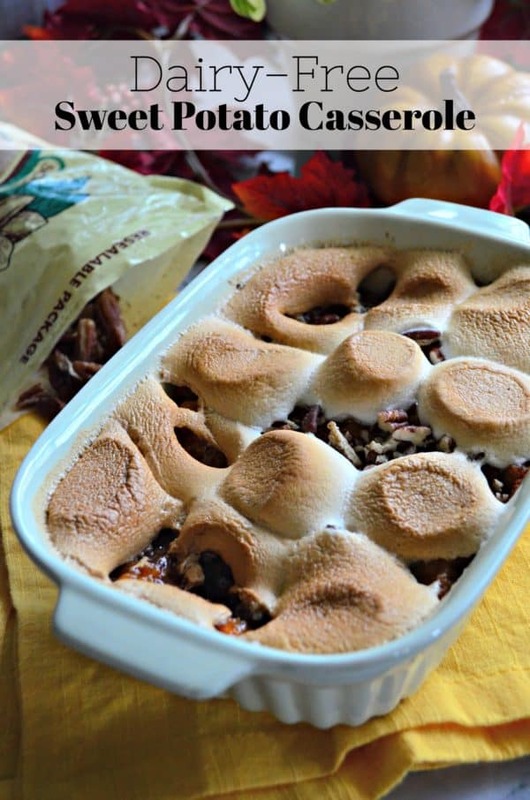 You can also make this casserole the day before and then bake with the marshmallows when your ready to eat. I will note that you will want to bring the dish out of the refrigerator and let rest for at least a half hour. Then bake for 20 minutes until the casserole is warmed through then top with the marshmallows. This will prevent the marshmallows from burning. So, if you’ve had to give up dairy or maybe have a family member or friend who has a dairy allergy I invite you to make this recipe for them this holiday season. Peal and boil sweet potatoes until fork-tender (about 15 minutes). Drain and place in a small baking dish. Place the Butter Flavored Coconut Oil, coconut sugar, and apple pie spice in the baking dish. Mash with a fork until desired consistency. 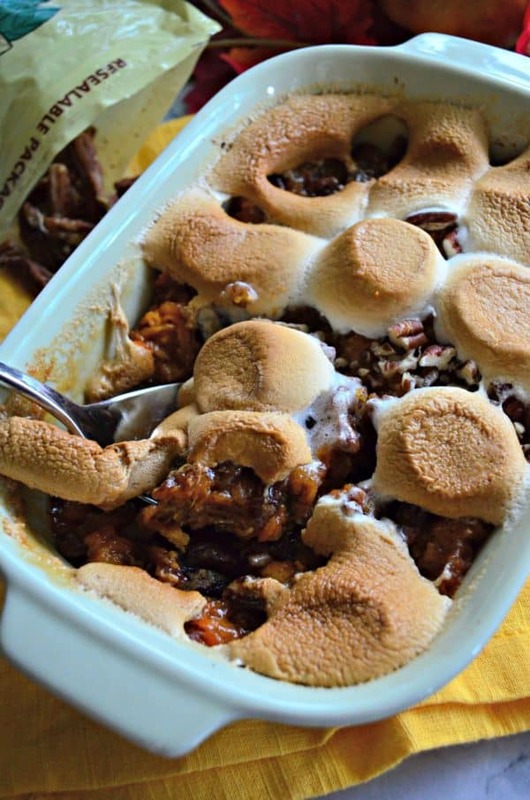 Top the sweet potatoes with chopped pecans and marshmallows. Bake for 20 minutes or until the marshmallows are melted and golden brown. Serve immediately.